We can live on average about 5 years, sometimes much longer! We need to be cared for and given love and affection every day! We need to be fed fresh vegetables, given water and fresh hay every day. We need somewhere warm and safe to sleep at night and a place to play and exercise during the day. Our hutch or pen will need cleaning regularly. We poop and wee a lot! Sometimes we will get sick and might need medicines from the vet. If you get bored of us, we will be sad! 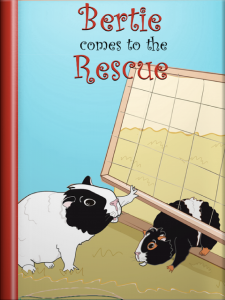 If you feel you are ready to give a guinea pig or even better, a pair of guinea pigs, a loving home for life, please consider adopting a guinea pig from your local animal rescue! We’ve re-homed several guinea pigs, from our local rescue. The arrival of one of them (Horatio, in 2012) inspired the story, Bertie Comes to the Rescue which features our local rescue, NEGPR. We’ve had several friends come to us from them since then! There are so many gorgeous guinea pigs like ‘Harry’ who are also looking for loving homes, could you give them one? Click here for a list of guinea pig rescues in the UK. Click here for guinea pig rescues overseas. 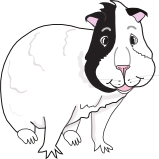 For more information on keeping guinea pigs and further information or care guides please visit Bertie’s Links page.